This dish is a variation of “Chicken al Mattone” or “Chicken Under a Brick”. It is a classic Tuscan preparation where a whole chicken is split open, flattened, and grilled under a hot brick. In our household, it is called “Chicken Senza Scuse” or “Chicken Without Excuses”. The name was coined after several failed attempts to alter the original recipe. I’m not a fan of cooking anything under a heavy weight. My better judgment tells me the pressure from the brick will force out much desired moisture and make the main ingredient dry and tough. For this reason, I decided to omit the brick portion of the recipe. It took a couple of attempts to perfect the revised version. The first one resulted in a spirited grease fire that engulfed the bird. I had neglected to blot the excess marinade off the Chicken before putting it on the grill. Janine noticed the billowing plumes of smoke wafting across the yard. “Honey, is everything alright?” she asked poking her head out of the patio door. “It’s fine. I’m just flambéing it for extra flavor…” was my reply. Unfortunately, both the excuse and the charred Chicken were hard to swallow. Removing the excess marinade tamed the flames on the next attempt but still yielded undesirable results. The skin of the chicken was perfectly golden brown and crispy on the outside but the meat by the bone was almost raw. Janine protested as she began to probe her entire serving with the tip of her knife. “But that’s how they eat it in Europe…” was all I could muster, knowing full well this performance wasn’t going to win me any Michelin Stars. Success was achieved on the third attempt. I seared both sides of the bird on a scorching hot grill and then finished it in a moderately hot oven. The grill added a smoky flavor from the caramelized proteins on the skin. 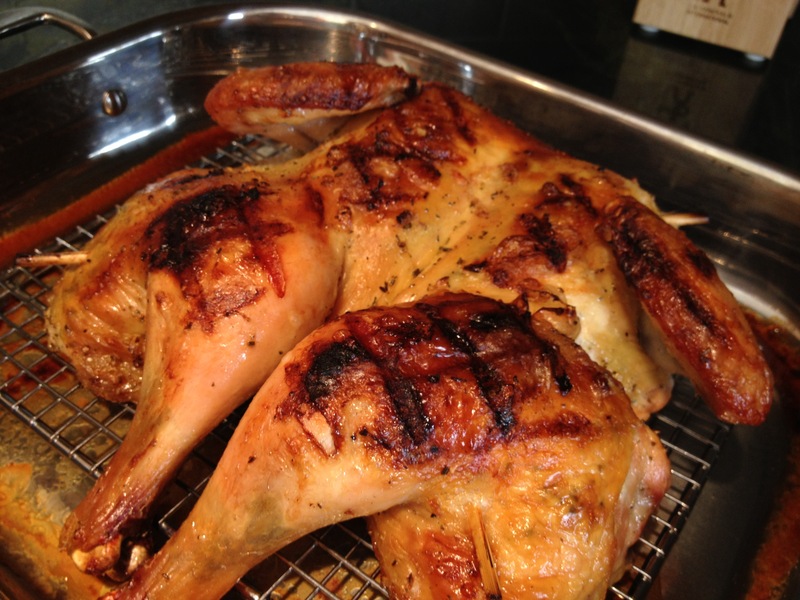 The oven enabled me to control the heat source and the internal temperature of the bird. It was a succulent dish that required very little effort and absolutely no excuses. 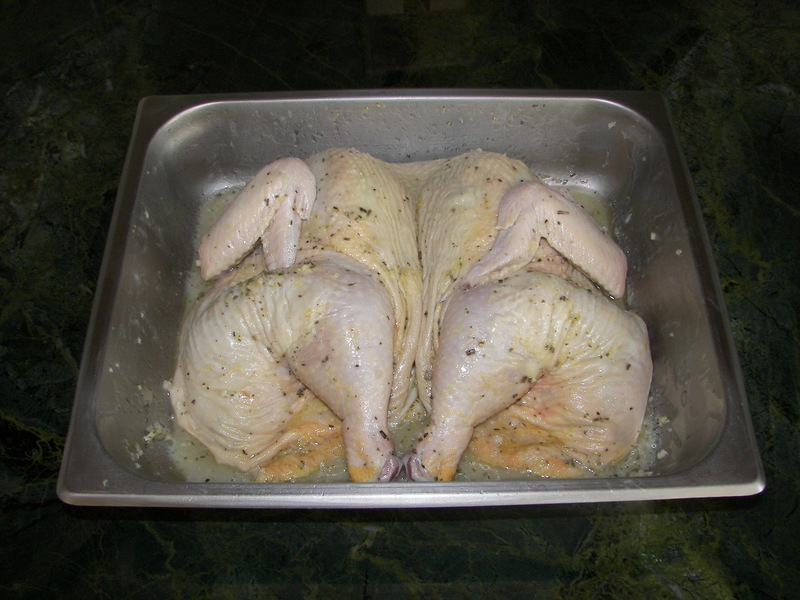 Split the chicken (see “How To” section) and then place Chicken in a large, non-reactive container (non-aluminum). Whisk together the first 7 ingredients in a small mixing bowl. Pour marinade over chicken. Work Mixture into chicken with your hands making sure both sides are well coated. Loosen the skin covering both sides of the breast and both thighs by working your fingers underneath and creating little pockets. Spoon marinade into pockets and distribute evenly with your fingers. As always, if you touch any raw poultry wash and dry hands thoroughly. Cover the bowl containing the chicken with plastic wrap and set in refrigerator (Do not use aluminum foil. It will react with the marinade). 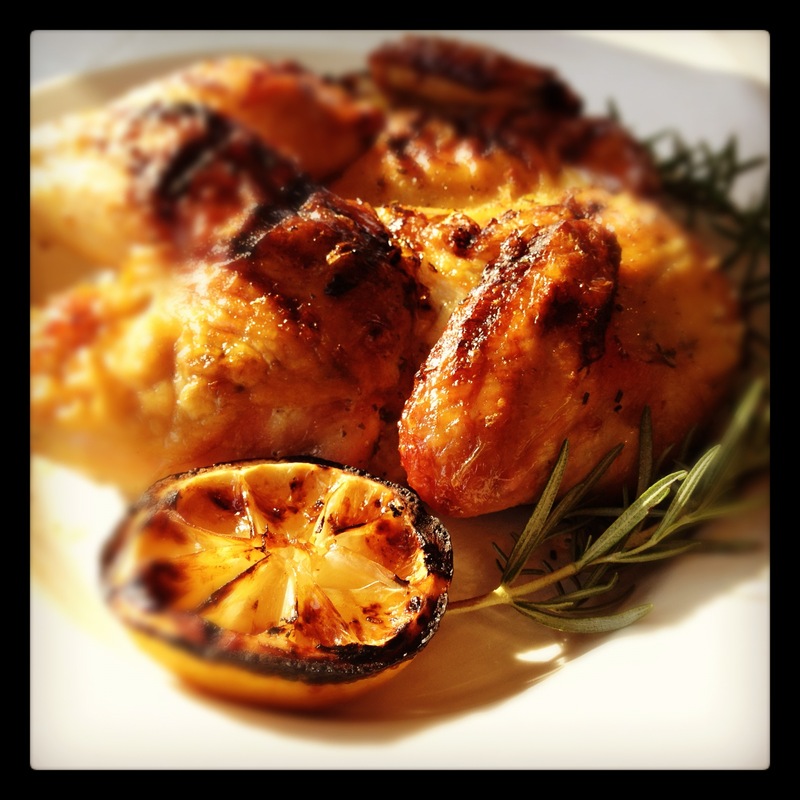 Marinate split Chicken for at least 2 hours or as long as overnight. 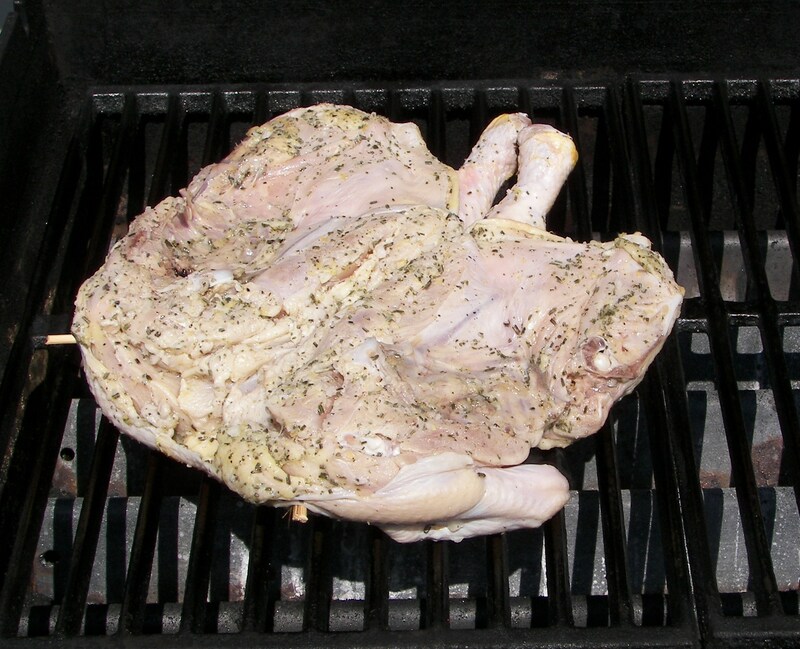 After ample time has passed, remove split Chicken from marinade and pat dry with paper towels. Note: This is a very important step. Failure to blot the excessive marinade from the Chicken will cause it to will fare up on the grill. The result will be burnt chicken that tastes like lighter fluid (This is the voice of experience talking). The split Chicken will be seared on the grill first, and then finished in the oven. Preheat the grill to 550 degrees and the oven to 375 degrees. 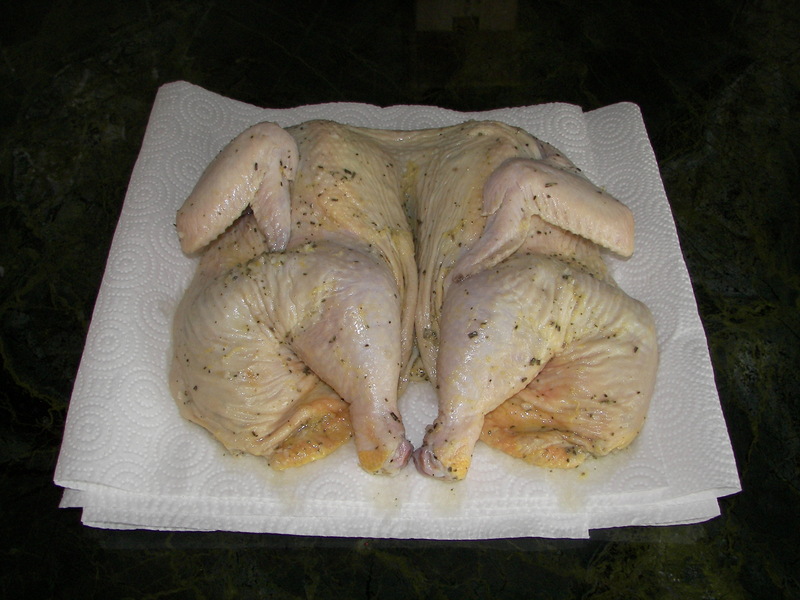 Lay the chicken on a flat surface once it has been wiped off. The skin (breast) side should be facing up. 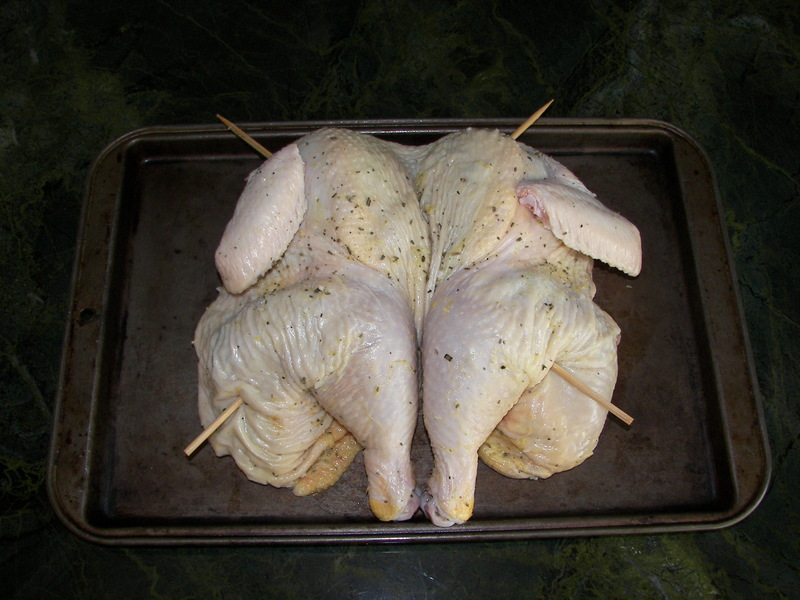 Insert skewers diagonally from thigh to breast, forming an “X” through the chicken. This will hold the bird together and make it easier to turn on the grill. When the grill has reached the proper temperature, place the Chicken skin side down upon it and sear until caramelized marks appear. 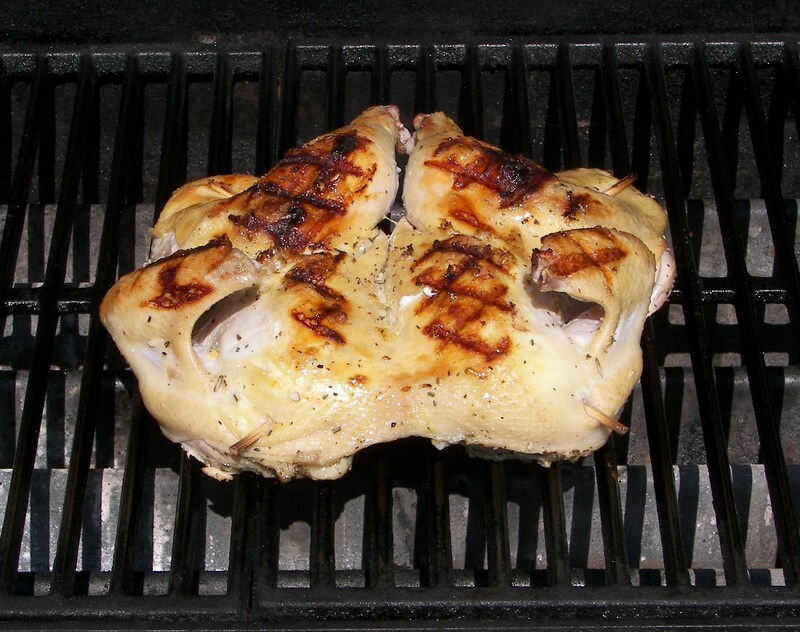 Turn chicken 90 degrees and continue searing until criss-cross grill marks have been achieved. Note: The grill has to be scorching hot before you put the chicken on. If not, the skin will stick to the grill and tear off when you go to turn it. Flip chicken and sear the cavity side being careful not to tear skin. Continue to cook for several minutes. 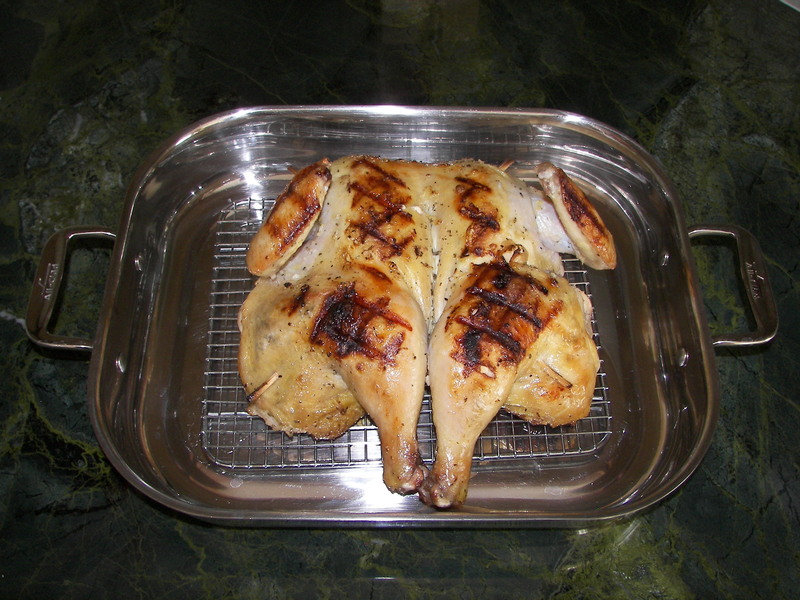 Then transfer the bird from the grill to an oven roasting pan. Finish roasting in the oven until a meat thermometer inserted into the bird reads 165 in the breast and 180 in the thighs. Remove bird from oven when the appropriate temperatures have been reached. Allow bird to rest for a few minutes before carving. Cut into desired portions and serve. That looks good!!! Makes me want to try it, I think I will very soon. Thank you for sharing! Please let us know if you do try the recipe. We would be very interested in your feedback.